Are you having difficulties deciding where you should ring in the new year? We know it is important that you welcome the new year in style as it sets the mood for the rest of the year! You are in luck as we have compiled a list of party venues which would be ideal for NYE countdown. Follow Venuescape‘s list and we will show you places which are perfect for welcoming the new year. Celebrate the new year with Marc Tanner at Elysium. Located on the 32nd floor of Wisma Goldhill, Elysium offers a breathtaking view of our city’s skyline and you will be able to enjoy the fireworks at midnight. To secure a table, make your bookings now. Located in the heart of town, consider having both your NYE dinner and countdown at Luna Bar. You’d be able to enjoy the buffet dinner while soaking up the atmosphere of the city in one of the most sought after bars in town. With a view of the city, you are guaranteed to be able to catch KLCC’s infamous fireworks display at the stroke of midnight. If you’re looking for a venue with old skool RNB and Hip Hop tunes, The Pound in Taman Tun is set to offer a Massive Rewind featuring DJ Abi on the decks. This is perfect for people who would like to ring in the new year (old school style) without getting stuck in massive traffic! Plus, with such attractive bottle promotions (3 bottles of Glenfiddich for RM1000 nett! ), it’s hard to resist ushering in the new year at The Pound. For an epic NYE countdown, head over to Play club at The Roof and ring in 2016 with a bang! Party up with Kino Takamura, DJ Def and Nigel Sparks. Expect champagne boats, pyro shows and special dance performances as they end the year with an epic NYE celebration. Join Malt & Leaf’s annual Black & Gold NYE party to celebrate the new year in style. Located at Sky Level, First Avenue Bandar Utama, Malt & Leaf offers a stunning 180-degree view of the city’s skyline, live DJ performances and a stylish new year eve countdown party. For all you party-goers who want to countdown in Bangsar, consider heading over to Six in Bangsar. 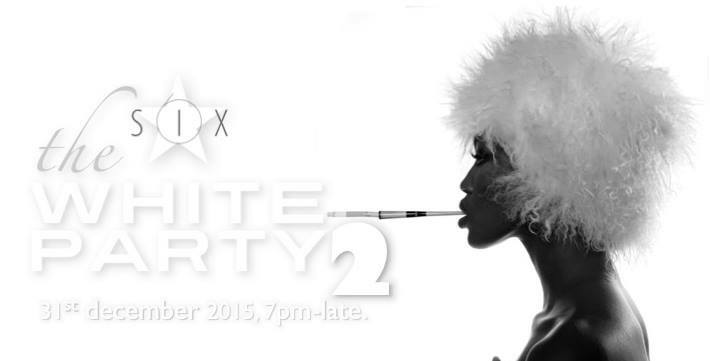 The SIX White Party kicks off at 7 p.m. onwards, perfect for welcoming the new year with a clean slate! 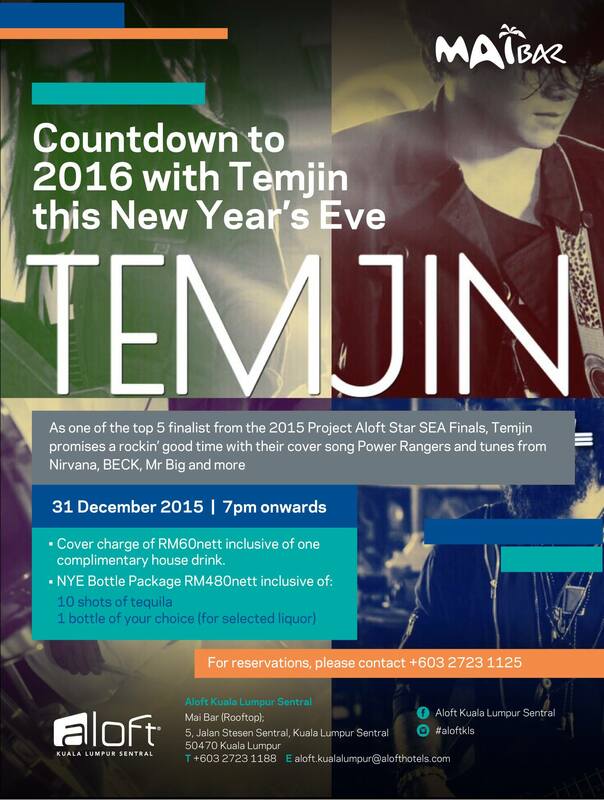 Another alternative is heading over to Mai Bar at KL Sentral and countdown to 2016 with Temjin. You’ll be sure to have a rockin’ good time as you jam along with tunes from Nirvana and BECK. If you love your tequila, grab as many friends as you can and take advantage of their NYE Bottle Package promotion! 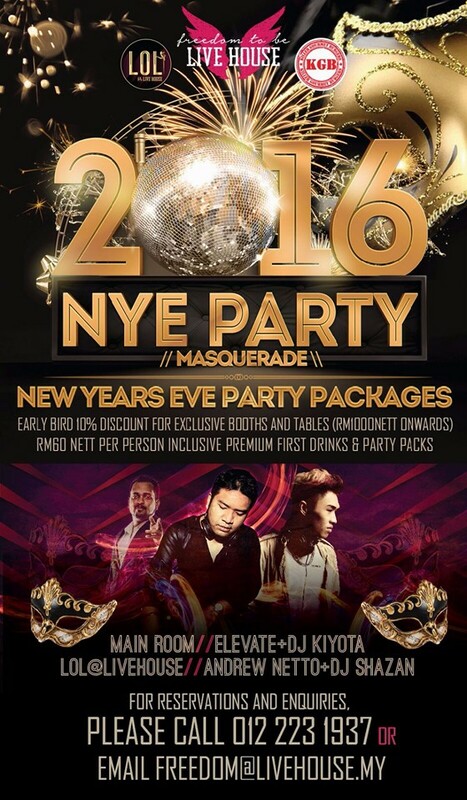 If you are set to party it up at TREC, check out Live House’s Masquerade Party. Catch stand up comedian Andrew Netto who will be performing at LOL @ Live House and Elevate, DJ Kiyota and DJ Shazan on the decks. 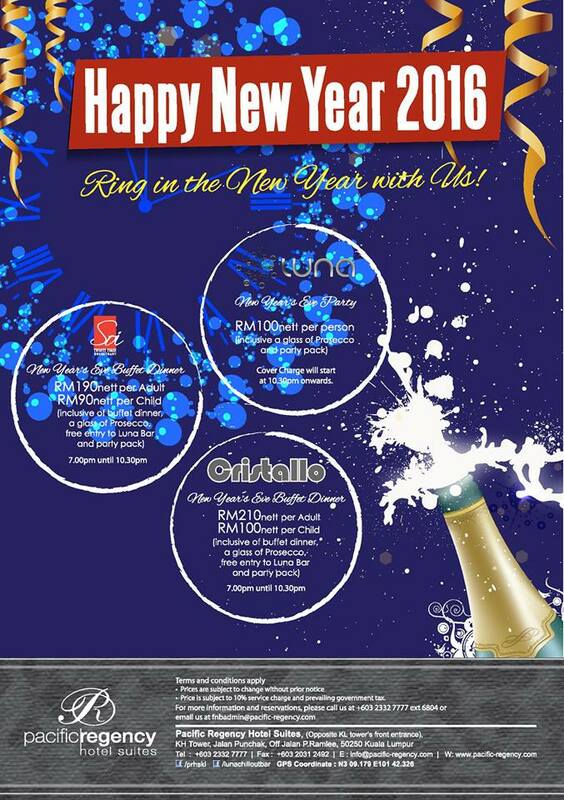 At RM60 per head, receive a complimentary drink and a party pack to usher in the new year. Be prepared to party with local celebrities and make sure you’re dressed to impress! 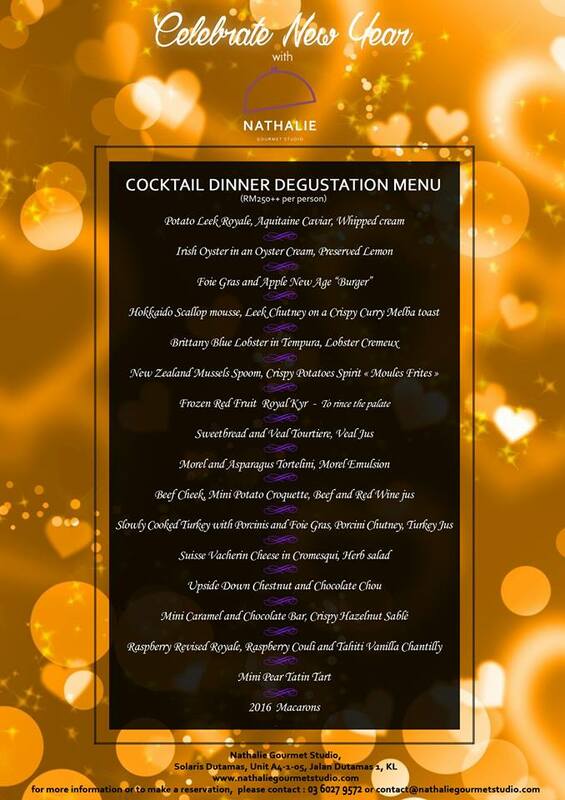 For those who wish to feast on NYE, Nathalie Gourmet Studio at Solaris Dutamas would be a great choice. End the year on a high note at a French Restaurant and let there be a party in your mouth instead! Located within a close proximity from town, you’d be sure to be able to catch the fireworks display at the end of the night. If you are running on a tight budget but would still like to usher in 2016 with a bang, head over to KLCC and catch the fireworks at midnight. Be prepared to be amazed by the fireworks display as KLCC never fails to disappoint! Be sure to head on there early to avoid traffic. If you prefer to Uber, sign up with our code ‘Venuescape’ to get 1 free ride worth RM30! We hope this eases your process of deciding where to party on NYE. If you looking for a venue for your own NYE party, head on to http://www.venuescape.my/ for venue options or contact us directly at +6012-7273 984. Team Venuescape wishes all of you a Happy New Year!